The third point here can’t be understated. Though we aim to make Prismata a high-quality product as a competitive game, there is a substantial cohort of Prismata players that is simply not interested in a competitive ladder. We want to do more to help them have enjoyable experiences outside of bot play, and events provide a way of achieving that. That’s why we’re experimenting with events during the alpha period. Prismata’s base rules form a rich foundation for a huge variety of game modes that vary greatly in scope and skill ceiling, and we think exploring that space is a high-value activity. We’ve been testing both of the above in Prismata’s Events page, and both have proven to be popular. Hence, our long-term plan will be to expand on both of the above, while also trying new things. The current weekly loop of events is intended to be temporary. The current implementation is mostly an artifact of how the scheduler on our server was originally programmed (it loops once a week for delivering daily bonuses and weekly ranked play tickets to supporters and bundle holders). We’ll soon be transitioning away from that system, and events will be scheduled in a free-flowing calendar and timed so that players in all time zones will have access to all game modes. The calendar will be updated regularly and events will be posted weeks in advance of running. We may retain some weekly scheduled events like Friday mode-of-the-week or Saturday afternoon brawls, but we expect most events will run at a different time whenever they are run, and may run less or more often than once per week. There could ultimately be dozens of formats, as some of our mode-of-the-week events will be used for brawls instead (you can see an example with the new “Price War” Brawl that we’ve just launched). And of course, we’ll continue to run special one-off events like last weekend’s Planetary Mega Brawl, which attracted a massive number of participants. From there, things could go much further. We could add a kind of “event score” to encourage players to achieve a certain number of event points over a week or over a “season” for a reward (e.g. a special badge if you could earn 100 event points in a month, and better ones for 200/500/etc.) We could even implement something like the Race Seasons in Path of Exile where the whole Event mode is essentially turned into a giant grand prix. The possibilities are endless. For now, we’re continuing to focus on only one new format per week (so that our development efforts remain fixed on getting to Steam Early Access), and we’ll be making only minor changes to the event functionality for the next few months. But we may redirect more efforts to event mode in the future, especially if particular events turn out to be unexpectedly popular. This week, we’re running an all-new Mode of the Week that we’re dubbing “Our Competent Robotic Helpers”. This mode is a variant of an older mode called LuckClick that was developed by Will and Alex many years ago, and was an internal favourite among Lunarch developers. The premise is simple: play a normal Prismata game, but Wacky Bot takes over for you halfway through. You can play a flawless opening and have the bot screw it all up, only to witness a dazzling comeback as your opponent’s bot fails to eliminate a key unit upon breaching. In the original LuckClick mode, players had 30 seconds to make as many moves as they could before Wacky Bot would take over (with no increment or time bonus). 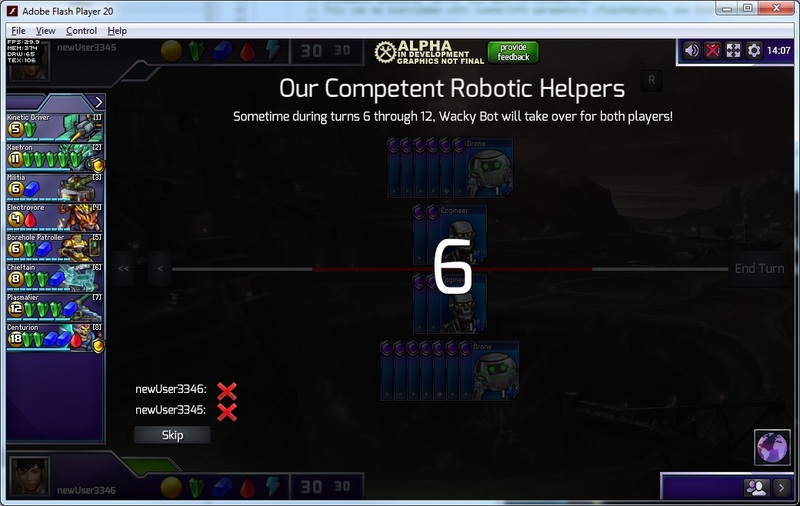 Robotic Helpers is a bit more mellow than that; instead, Wacky Bot takes over at a random time between turns 6 and 12. You never know when it’s going to happen. Wacky Bot always takes over for both players at the same time, but player 1 and player 2 each have a 50% chance of being usurped first. In addition to the 10-hour open Mode of the Week running on Friday afternoons/evenings, we’ve also added a 1-hour Mode of the Week Brawl at 1pm EST on Sunday. There, you’ll be able to play Robotic Helpers for prizes and a special event badge. Timers are reduced to 20 seconds per turn for Mode of the Week Brawls. Our new Price War Brawl event now runs every Thursday and features 4 of our most popular Mode of the Week events: Random Tech Costs, Monogreen Tech, Gold Rush, and Gold Drought. All of these events alter the prices of Prismata units, leaving you to completely rethink your build orders and how you evaluate each unit. Like the Mode of the Week Brawl, this event runs for an hour, features 20-second-per-turn time controls, and awards a number of prizes. Our Potpourri and Mode of the Week events now feature participation prizes as well. You only need to play a single game of each to be eligible. We’re aware that there’s currently no way to determine who won the prize if you were offline when it was awarded, and we’ll be looking to fix this in the future. Do you have any ideas for new events we should run, new Mode of the Week ideas, or other things you’d like to see in event mode? Let us know! 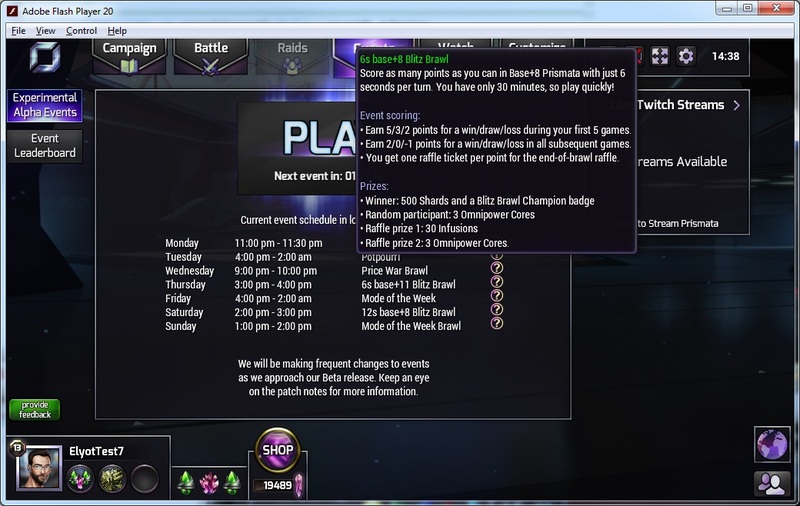 ← Prismata Beta Pre-Season Event 3 is the PLANETARY MEGA BRAWL, and it’s happening on Sunday!